I got my first home computer on Christmas morning in 1982. It was a TI-99/4A with 16K of RAM. In the years that followed, I moved on fairly frequently to a new system, selling the old to fund it. I was doing basically the same, with less frequency, when I started building a vintage computer collection back in 1999. It was then that I began re-acquiring systems that I knew and loved from years past as well as certain systems that I badly wanted way back when but were much too expensive at the time. Collecting configurations that I have previously owned gets me thinking and writing about those original systems. It’s this sort-of reliving of the experience of using those systems for the first time that is perhaps the most satisfying facet of this, my hobby. As such, I value any photographs that I have of those original setups. 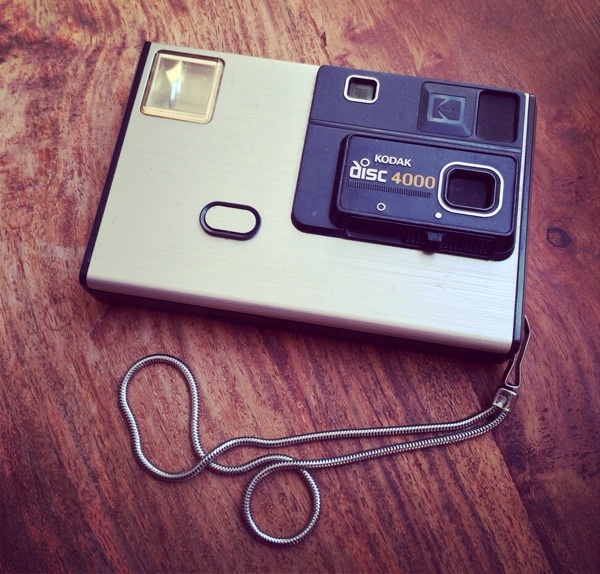 Sadly, I lack photos of most of them, having owned them in the days long before everyone started packing a pocket internet machine / GPS / camera. On visits to my parents’ houses I would spend considerable time poring over myriad boxes and binders of photos, looking for any undiscovered visual records of the systems of my past. I found a few, but not many. And in searching I found a number of rolls of undeveloped film. I found a roll of 35mm film from the early 1990s and had it developed locally. The quality was weak after all those years, but it did give me a photo of my second Macintosh, the Mac LC. The rest of the undeveloped film that I found weren’t rolls but discs. Three rather older discs, holding unknown photos taken in the mid-1980s. Discs? In 1982 Kodak introduced a series of consumer-oriented cameras that used disc film which consisted of a disc of film offering 15 10x8mm exposures, contained within a squarish, plastic case. 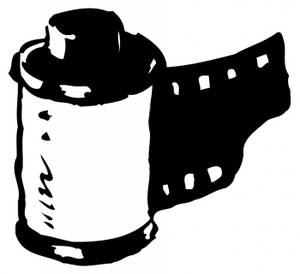 The film and the cameras that used them were thin and convenient for the day, but the image quality left much to be desired and ultimately it was not a highly successful format. I received a Kodak Disc 4000 camera (the mid-tier unit) for Christmas 1983 and used it for several years, taking photos of family, friends, and whatever else … including my computers. Now, the disc film format died long ago and you can’t just walk into a CVS or even a Ritz Camera and get a disc developed. In fact, there are only one or two remaining places in the country that are equipped to develop disc film. One of them is the Rocky Mountain Film Lab in Colorado. Back in 2012 I sent two discs in to the lab for development and was told that they wait to accumulate a certain threshold of disc film development orders before running them through a development process that involves a special chemical mix geared towards getting the most out of very old film. A year passed with no news, but when I found a third undeveloped disc I sent it in to add to my order. There was no word from the lab for three years, despite a few inquiries, and I came to feel there was little hope of ever seeing what might be captured on those discs (not to mention development fees paid). On just arriving home from a week at the beach, however, I found a package containing three disc film negatives along with two CD-ROMs waiting for me. With fingers crossed and in great suspense, I popped the CDs into my iMac. Forty-five photos in all came back, and it was one of the very first shots I loaded up that instantly confirmed that my $120 and lengthy wait had paid off. The image I was most hoping to find was of my very first computer system, that TI-99/4A. 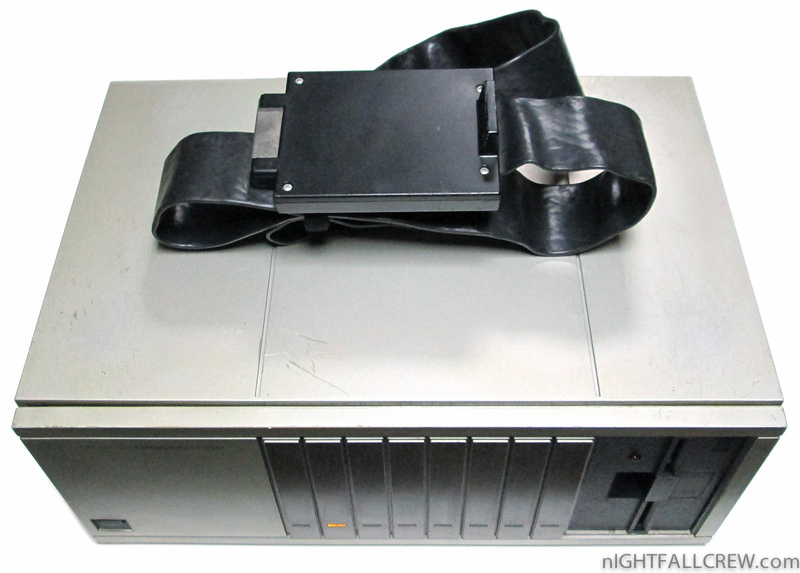 A fully expanded TI system is an interesting sight to behold, with its large Peripheral Expansion Box containing eight slots and a full-height drive bay. It’s built like a tank (I think I could probably stand on it without doing damage) and tethered to the main unit by a huge data cable. I wanted a photo of my fully expanded setup, sitting on the wooden desk my father and I built specifically for that system. I know for a fact that I took and developed such a photo back in 1983 (more on this in a moment), but I’ve not had it for decades. 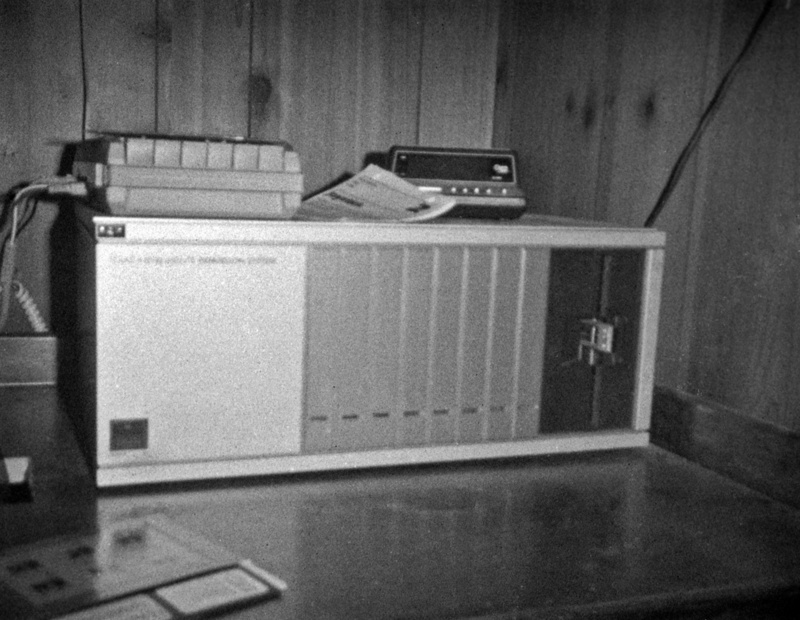 While I already had two decent quality photos of the system unit itself [one, two], the only photo I had of the entire system was a tiny photo within a photo; in a photo I took of the Apple //c that replaced the TI system in 1984 (which I do have), the aforementioned photo (3×5-inches) of my entire TI setup can be seen taped to the desk that the //c is sitting on. (It’s like that one scene in the movie Time Bandits where they lost the map but had a photo of themselves holding the map, and so could still make out the map to a degree.) Inset is the only photo of the complete system I’ve had all these years (click it to see the Apple //c photo that contains it). The difference in clarity between that tiny, blurry photo-in-a-photo and the two 33-year-old photos of my TI system that have just been developed is like our best look at Pluto, before and after New Horizons. And, a nice bonus is a look at my trusty little 10-watt Sears LXI stereo cassette system that started off my love of ’80s pop, which is as strong now as it was back then. While, sadly, time’s toll on the film stole away most of the photos’ color, some of the photos on those three discs are rather sharp, the two photos of my TI setup among them. (In the second photo, a closeup of the PEB, note the rectangular hole cut into the desk to pass the huge data cable down under at the far left.) Most of the photos recovered were of family activities, but there were several other computer photos. One of the lower quality photos in the lot is the only picture I ever took of my Atari 400, purchased for $25 at a local Toy Castle in 1985, I believe. There are also several photos of my Apple //c as well as a photo I took of the cover of the 1985 Personal Computing magazine that introduced me to the Amiga and set me on the path to replacing that //c with one. Obviously that magazine had my attention, as I explained in an earlier blog post. It would be nicer if it hadn’t taken four years, but this exercise in photo spelunking, diving into the unknown depths of my ancient undeveloped film, has been rather fascinating. About six months ago I stumbled onto a roll of undeveloped Kodak 110 from 1979 in the back of a drawer… I think it’s time for another adventure. Stay tuned! UPDATE: Retrocomputing overlord Chris Osborn ( @fozztexx ) merged my newly developed system photo with the colormap of the tiny picture-in-picture photo and came up with this much nicer overall shot. Hats off, FozzTexx! 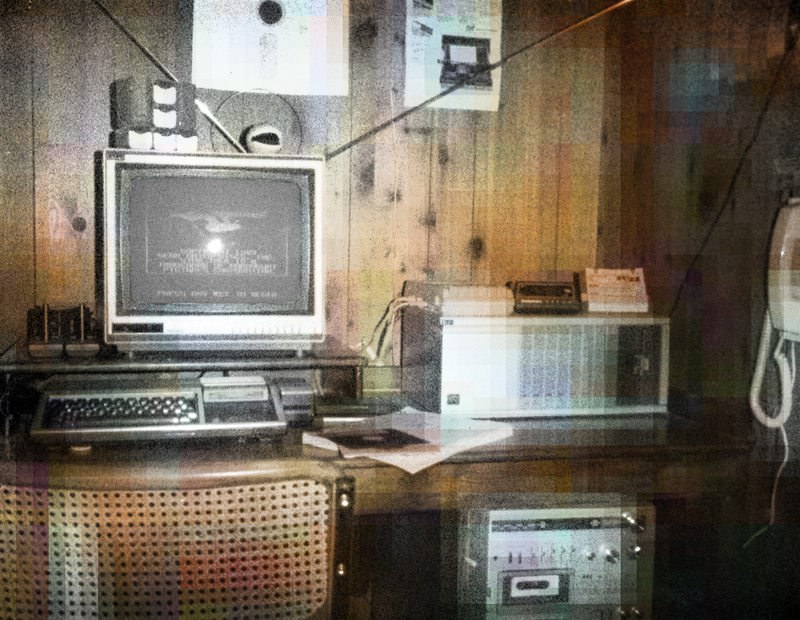 This entry was posted in Apple II, Atari, Down Memory Lane, Just Rambling, TI-99 and tagged 1983, Apple, Atari, film, Kodak, NASA, negatives, photo, photography, texas instruments, vintage. Bookmark the permalink. Ha, it looks just like your current setup, too! I had that rubber squeaky Pac-Man that sits atop your monitor. I had to jealously watch my stepdad by the expansion box and official TI monitor (color) while I was stuck using the sluggish cassette player to load games. I did have the speech synthesizer which was amazing for its time. People forget how far ahead that was. Used to type in code from computer mags to create games. Unlike you I only moved on a few times – C64 then PC but the TI started it all for me and I remember Parsec and Alpine and others with lots of nostalgia. 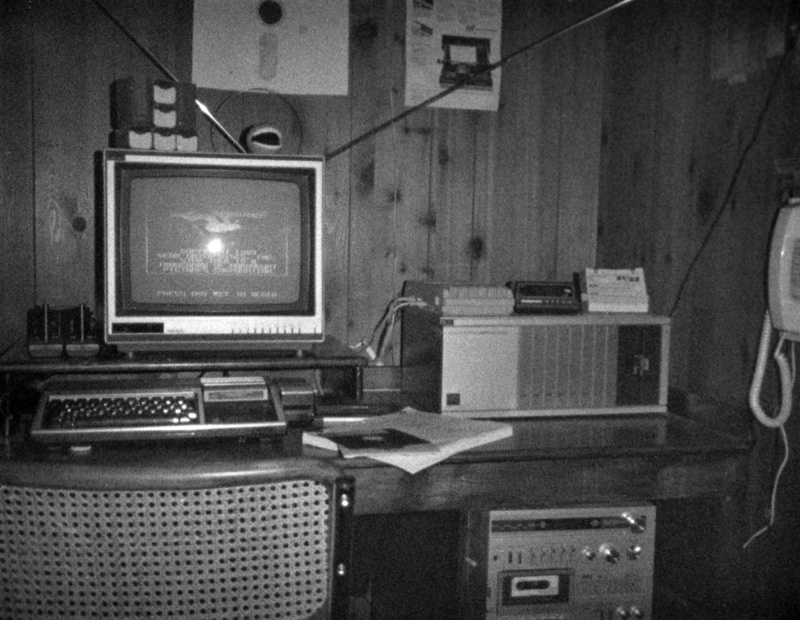 Inconceivable today….our whole family used to play text adventures like Pirate Adventure in that machine together for hours. Those moments when the family gathers around certainly glow bright in one’s memory. Something I need to remember to pay forward. While we cannot keep all the things we make or enjoy in our childhood, photos like this remind me to encourage kids take their photos…never know what they will treasure 30 years later. I love this kind of stuff! EXCELLENT! I loved it, thanks for sharing.